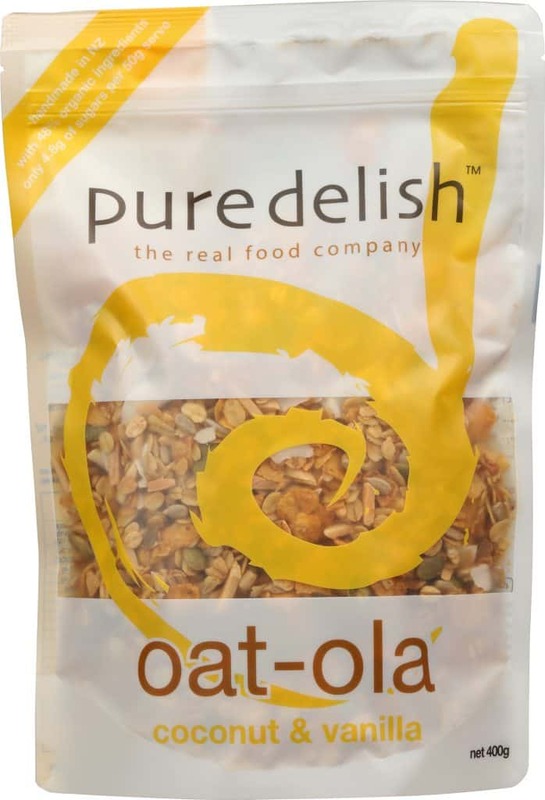 our coconut & vanilla oat-ola is a handmade granola made from nutritious organic oats, crunchy flakes, coconut and a good splash of premium double-fold pure vanilla. lightly coated with coconut nectar then baked until crunchy! ingredients: organic rolled oats (42%), seeds (sunflower seeds, pumpkin kernels, chia seeds), nuts (almonds, organic coconut (6%)), gluten-free cornflakes (9%) (corn, sugar, golden syrup, salt, emulsifier (471), vitamins and metals), coconut nectar (9%) (coconut neera, calcium carbonate), NZ cold pressed extra-virgin rapeseed oil, vanilla bean paste (1%), sea salt. contains oats, tree nuts, gluten. may contain traces of wheat, barley, rye (from oats) and milk, peanuts, soy (from cornflakes).